Jeffress was one of the first conservative evangelical leaders to figure out that they could help dictate Trump’s policy decisions as long as they kept on telling him that he was chosen by God to lead the United States. 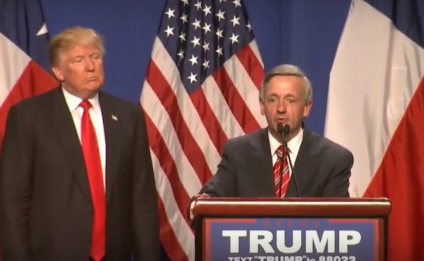 Trump was thrilled by Jeffress’ early support for his presidential campaign, bringing him along to a number of campaign events and naming him to his evangelical advisory board. Since then, Jeffress has been among the Religious Right leaders who have been invited to the White House multiple times. Last month, he joined fellow evangelical allies of Trump in issuing statements defending Trump’s son-in-law Jared Kushner against allegations of collusions with Russian government representatives in the election. Before he became a leading proponent of the Gospel of Donald Trump, Jeffress was known for his fiery rhetoric against Catholics, Mormons, Muslims, LGBT people and legal abortion.